So what’s all the hubbub that resulted in a WSJ article and subsequent PC Nation article on Sunday? Well, in essence, two electronics retailers are battling over use of the term GEEK as a trademark for their services . . .
Best Buy and Newegg both offer retail electronic sales and repair services. On May 26, 2011, Best Buy sent Newegg a cease and desist letter, which Newegg then posted to Facebook on June 9, 2011. The C&D instructs Newegg to cease infringing on Best Buy’s GEEK SQUAD mark, orange and black GEEK SQUAD trade dress, and Geek Squad Tie and Power Button design. The letter emphasizes Best Buy’s expansive nationwide use of its GEEK SQUAD mark since 1994 in print and TV advertising, on www.geeksquad.com, on branded apparel and other promotional items. 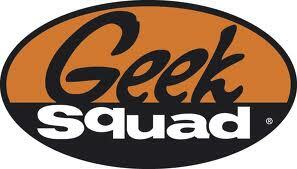 Best Buy has three federal trademark registrations for GEEK SQUAD: one, two and three. It claims a first use date of October 24, 2004 for “computer peripherals and accessories, namely, cables and connectors, surge protectors, universal power supplies and flash drives” and July 15, 2007 for “home theater and car electronics installation and repair.” Two of the registrations are for the stylized mark shown above (albeit without claim to color), which I am sure Newegg will argue distinguishes the marks significantly. I wonder why Best Buy did not register GEEK SQUAD (in standard character format, without claim to stylization) for “retail store services featuring electronics,” or “computer repair services.” Those seem to be the core services offered under the mark, which are at issue in this dispute. THIS ADVERTISEMENT PHOTOPLAY IS A WORK OF FICTION. ANY SIMILARITY TO REAL PERSONS (LIVING OR DEAD), BUSINESS ESTABLISHMENTS, PLACES, EVENTS, OR OTHER MATERIAL IS COINCIDENTAL AND UNINTENTIONAL. IT IS SOLELY INTENDED TO PARODY AND DRAW ATTENTION TO ANY BUSINESS ESTABLISHMENTS (BUT NONE IN PARTICULAR) THAT PROVIDE POOR CUSTOMER SERVICE, AND NO INFERENCES SHOULD BE DRAWN ABOUT THE IDENTITY, AFFILIATION OR LOCATION OF ANY PARTIES OR BUSINESSES DEPICTED. NO ANIMALS WERE HARMED IN THE MAKING OF THIS COMMERCIAL. Neither party mentioned Newegg’s use of the tagline: TAKE IT FROM A GEEK, with which Best Buy apparently is not concerned (though I suspect that will change if this matter winds up in court). What will happen next? My guess is more public wrangling followed by one of two outcomes: amicable resolution (not looking likely) or a lawsuit. (8) Whether there’s been concurrent use without confusion. The WSJ article states that Best Buy has challenged more than a dozen geek themed trademarks in the past decade including Rent a Geek, Geek Rescue and Speak With A Geek. Newegg must have adopted its GEEK ON mark with this known risk. The question is whether it can leverage enough publicity from the dispute to offset the costs of defending its marks. What do you think?